Drop by the Gig Harbor Eagles Club at 4425 Burnham Drive to experience a treasure of unique, custom, affordable holiday gifts from over 30 vendors from around the community. The Eagle members go all out to provide you with food as you shop- come early for a full breakfast bar or grab a lunch for you midday shoppers. My favorite vendor makes homemade chocolates- beyond her yummy clusters she has crafted her chocolate into molds such as tool sets, motorcycles and other custom items. Now that is what I call a truly unique gift. You might even get her to mold you up a customized piece. Special handmade booties that cannot be removed by kidsPick up your fresh wreath from members- Turnbulls Trees where all the profit goes to scholarships. Come on over and get some of your holiday shopping done, grab some grub and meet some of the members of the Gig Harbor Eagles. They will be glad to show you around. 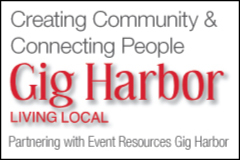 To learn more about the club and what they do go to this link on Event Resources Gig Harbor.